Lothair II ceded the southeastern parts of Upper Burgundy to his brothers, whereas Charles of Provence received the bishoprics of Belley and Tarentaise in 859, and Louis II of Italy the bishoprics of Geneva, Lausanne and Sion a year later. Charles of Provence suffered from epilepsy and died heirless in 863, and his kingdom was partitioned between his brothers. 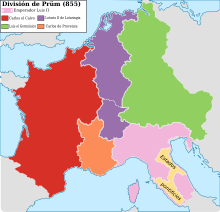 Lothair II, his heir, received only the western Lower Burgundian parts (bishoprics of Lyon, Vienne, Vivarais and Uzès) which were bordering his western Upper Burgundy (remnants of his original Burgundian possessions), while Louis II received the whole rest of the Kingdom of Provence. In 869 Lothair II died without legitimate children so his heir was his brother, Emperor Louis II of Italy. As Louis was at that time campaigning against the Emirate of Bari, his uncles, Louis the German and Charles the Bald, took his inheritance. Charles had himself crowned in Metz the same year, but was forced by his brother to partition the short-lived Lotharingia, together with the lands Lothair II acquired after the death of Charles of Provence, as they had agreed at Metz in 868. 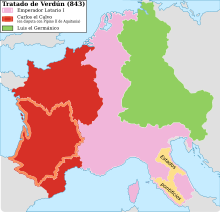 Their contract of 870 at Meerssen replaced the 843 Treaty of Verdun, after which the Carolingian Empire was also split into three parts, by dividing the northern half of Middle Francia stretching from the Rhone valley to the North Sea, in effect recombining sundered territories of Francia into two larger east and west divisions. However, at this time large parts of the Frisian coast were under Viking control and therefore only divided on paper. The borderline ran roughly along the rivers Meuse, Ourthe, Moselle, Saone and Rhone. In the north, Louis received most of Lothair's Austrasia, with his eastern part including both Aachen and Metz, and most of Frisia. But in the south, while Louis received most of Upper Burgundy that was left to Lothair (after ceding the southern half to Italy), Charles received Lothair's inheritance in Lower Burgundy (including Lyon) and a small western part of Upper Burgundy (parts of Portois and Varais (including Besançon)) - this opened him the way to Italy. Louis joined the newly acquired parts of central Austrasia to the subkingdom of his son Louis the Younger in eastern Austrasia, while the illegitimate son of Lothair II, Hugh, was granted the Duchy of Alsace. The arrangement did not endure more than ten years. Upon the death of Louis the German in 876, Charles the Bald, by then King of Italy and Emperor, attacked eastern Lotharingia, but was defeated by Louis the Younger in the Battle of Andernach (876). In turn, after Charles the Bald had died and his successors struggled to consolidate their rule over West Francia, Louis the Younger campaigned in western Lotharingia in 879. Charles's grandsons were forced to cede the whole Lotharingia to him, sealed by the 880 Treaty of Ribemont, according to which it finally became part of East Francia. Chisholm, Hugh, ed. (1911). "Mersen, Treaty of" . Encyclopædia Britannica (11th ed.). Cambridge University Press. This page was last edited on 2 January 2019, at 22:16 (UTC).